In Part 1, we covered the basics of different beef cuts. Now you that you know your way around the meat department, let’s take a spin through the cooking methods that make each cut of beef really shine. 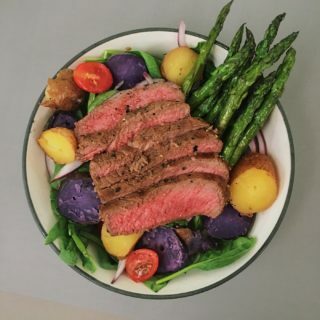 Depending on the composition of the beef – including fat and connective tissue – it’s important to choose the technique that will minimize moisture loss while increasing tenderness and maximizing flavor. Already have a cut of beef on hand or a dish in mind? Check out the handy chart below to match any cut of beef with the best cooking technique. Primary meat cooking techniques include braising, stewing, pot roasting, barbecuing/smoking, pan searing, grilling/broiling, pan frying, roasting, and stir frying. Moist heat cooking is simply that: techniques that involve cooking with moisture to transfer heat to the meat, such as steam, water, stock, or wine. Typically, moist heat techniques are used for beef cuts that are low in fat and/or high in connective tissues. Longer and slower cooking times break down connective tissue without losing moisture, making tough cuts tender. The collagen lubricates and tenderizes the fibers and creates that soft, fork tender quality we all seek. Moist heat cooking methods include braising or pot roast, and stewing. Dry heat cooking is similarly face value. Dry heat cooking techniques transfer heat to meat without any moisture, either through fat (such as pan frying) or indirect/direct application of radiant heat (such as grilling). Dry heat cooking is best for more delicate cuts of meat, the ones that come from the less exercised parts of the animal. Dry heat methods add robust flavor. These cooking methods are often done over high heat for short periods of time to prevent drying out the beef, and/or combined with slower, lower heat cooking to finish. Dry heat cooking techniques for beef include barbecuing/smoking, grilling/broiling, pan frying, pan searing, roasting, and stir frying. Braised beef makes for fall-off-the-fork beef from the least tender cuts. To braise beef, meat is first browned, then cooked, tightly covered, in a small amount of liquid at low heat for a long period of time. The result is highly flavored, tender beef. Beef is usually braised in the oven, but can also be done on the stovetop. Best cuts of beef for braising: Chuck, brisket, round, short ribs, flank steak, skirt steak. Beef stew is a staple of the colder months. Stewing beef is very similar to braising, except stewing submerges the beef completely in liquid, versus the minimal amount used to braise. The meat is generally cubed or cut into small pieces prior, and the cook time can be shorter as a result. It’s counterintuitive, but tougher, inexpensive cuts make the best beef stews. Don’t make a stew with tender or fatty meat. Best cuts of beef for stewing: chuck roast, chuck shoulder, round roast, short ribs, cross-cut shanks. Think of your favorite smokehouse. Technically, barbecuing or smoking beef is different than grilling (see below). Barbecuing involves cooking for very long periods of time using indirect, low-heat. Barbecuing is typically done over logs or wood chips that smoke the food. Best cuts of beef for barbecuing/smoking: whole rump, brisket, shoulder, short ribs, prime rib, ribeye. Grilling is the most popular method to cook what we know of as “steaks.” Grilling means cooking over a gas or charcoal grill or other heat source. Usually grilling involves high heat for a short period of time, with or without a finish on lower or indirect heat. Best cuts of beef for grilling: tenderloin steak (chateaubriand, fillet, tournedos), sirloin steak, ribeye steak, rump, porterhouse, t-bone, prime rib, flank steak, skirt steak, hangar steak. Click here for more on grilling grass-fed beef to perfection. Pan and stir frying is a quick, easy way to prepare your beef any time of year. Pan frying is a fast cooking method involving a small quantity of hot fat, such as oil or butter, and typically high heat and shorter cook times. Stir frying is a variation that incorporates smaller pieces of meat over very high heat while consistently stirring. Stir frying at home (vs. in a restaurant) should be done in a skillet versus a wok. Marinating the meat first is a nice touch. Best cuts of beef for pan frying and stir frying: fillet, ribeye, sirloin, T-bone, rump, tenderloin, flank steak, skirt steak. Similar to pan frying, pan searing is a stovetop method that uses a skillet over high heat with a little bit of oil. Reverse pan searing is best for thicker steaks (over 1 inch), and begins in the oven and finishes on the skillet. Pan searing allows for even cooking and you can repurpose the juices created for a beautiful pan sauce. 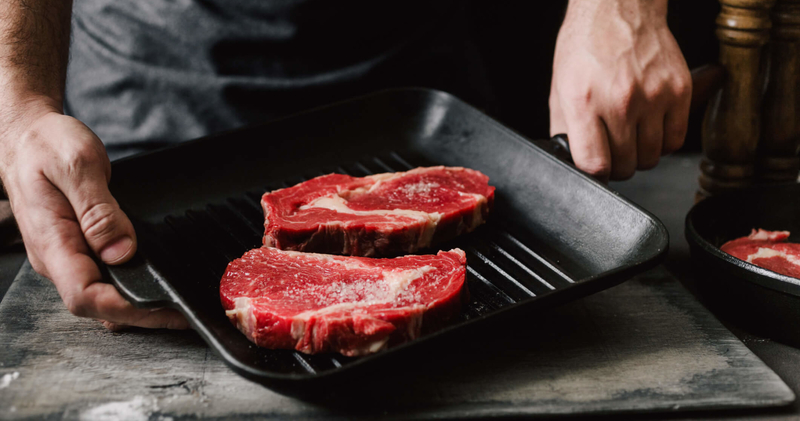 Best cuts of beef for pan searing: tenderloin steak (chateaubriand, fillet, tournedos), sirloin steak, ribeye steak, rump, porterhouse, t-bone, prime rib, flank steak, skirt steak, hangar steak. We all love a good roast beef. Roasting usually incorporates larger pieces of meat cooked uncovered in the oven. The moisture reduces while the connective tissues and fat soften, tenderizing the meat. Roasting oven temperatures and times can vary significantly depending on the cut. Meat is almost always browned first. Best cuts of beef for roasting: prime rib, sirloin roast, ribeye roast, whole tenderloin roast, chuck roll, rump. Our extended post on holiday roasts is upcoming, stay tuned! Now you know the best cooking method for every beef cut — so make your way to the meat department, get your favorite Verde Farms grass-fed beef cut, and impress everyone at the dinner table tonight. They might think it’s hard to cook beef… but now you know better. Go get ’em.